What are the requirements for the DC power supply (PS) voltage? Measured minimal voltage between control points CP8 and CP11 should not be less than 11.8 V. The maximal voltage at the amplifier control points should not exceed 15.7 V. (the DC PS voltage at the terminals of the RJ45 connector on the amplifier board should not be less than 12.1 V and more than 16V because there are 2 chokes between the RJ45 connector and control points with voltage drop of 0.3 V). Be aware that there is also a voltage drop in the FTP cable, so higher voltage should be used. See Mounting instructions. There is an internal 7810 IC (10 V) stabilizer in the amplifier and if the input voltage is too high the temperature might exceed the permitted limits. The amplifier can be fed also by accumulator battery. 12.2 to 12.8 V is the usual voltage given by the charged lead acid accumulators and they can be used to supply the amplifier if the cable is not very long. What receiver sensitivity do I need? The gain of both amplifiers is set in a way that the internal output noise of the amplifier (no antenna connection) to be greater with 8-10 dB than the input noise of the receiver with MDS of -128 dBm @ 500Hz BW. This sensitivity is very common between commercial equipment. Most of the RX or TRX have preamplifiers and their MDS is lowered up to -140 dBm. When using long length of the FTP cable it might be necessary to increase the sensitivity of the RX. See also Fig.1. in Description and Specification section and in Q&A(4.3 Cable) section. What is the real sensitivity of the active antenna? The atmospheric noise at the usable frequencies is the limiting factor which limits the RX sensitivity. The atmospheric noise at the output of a good active antenna should be at least several dB above the output internal noise of the antenna amplifier. (This is the good old rule – if we connect the antenna to the RX input and the noise increases that means the RX has sufficient sensitivity). If this requirement is fulfilled the small active antenna will produce comparable S/N levels compared to a full sized antenna. Of course, high placed full sized antennas have better reception for low angle signals and field intensities are probably higher due to the clear space around them. Also directional antennas have much better reception for signals coming from certain directions etc. Our observations show that the small active loop antenna sensitivity when placed at low height is limited by its internal noise in quiet rural places at daytime when the bands below 10MHz are almost closed and the atmospheric noise is very low. The vertical dipole mode has lower noise floor (with 3-6 dB) and thus it is more sensitive in such conditions. At night on these frequencies the atmospheric noise has much higher level and the loop antenna sensitivity is not limited by its internal noise floor anymore. Experimental results of the measurements of the atmospheric noise in rural location are given on Fig.1 and Fig.2. The measurements are made in twilight time (18:30 local time) when the lower bands begin to open. As it can be seen, the total noise (atmospheric + internal) is higher than the amplifier noise at lower frequencies where there is propagation. For this particular measurement, at frequencies above 22 MHz, there was no propagation. As a general rule if there is a good propagation on certain frequencies the band noise is also higher and these small antennas usually are limited by the atmospheric noise. For more details see . 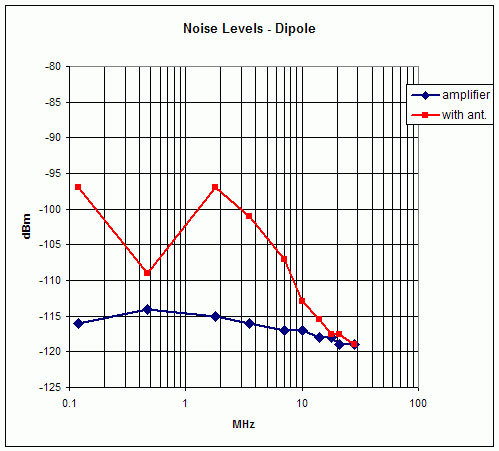 Fig.1 Experimental measurements of the output noise levels the amplifier with dipole antenna at 1 KHz bandwidth. The antenna is a fat vertical dipole (described in Antenna section 3.3). The time is 25. 09.2011 18:30 local time (15:30 UTC). The amplifier is connected to the control box with 18 m long cable. The internal output noise of the amplifier (blue ) is measured with 10 pF antenna equivalent and with cable. 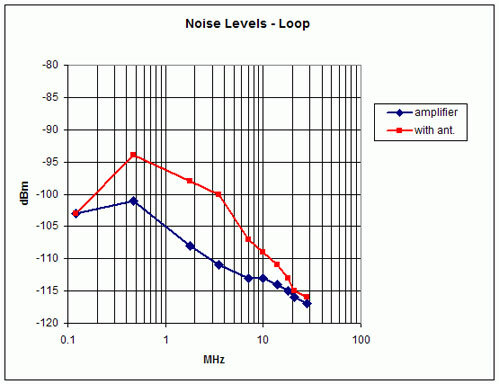 The total output noise (atmospheric noise + internal noise) is the red curve. The atmospheric noise levels below 0.5 MHz are probaly lower but there is a local noise form pulse PS unit. The bands above 22MHz were closed. Fig.2 The same measurements with the amplifier with loop antenna. The antenna consists of two crossed parallel loops (described in Antenna section 3.3). The time is 5 minutes later. The internal output noise of the amplifier is measured with antenna equivalent of 4uH (blue). Can I receive stations in LF band? Even at these low frequencies (below 300 KHz) the internal output noise of the amplifier is still above the noise floor of the RX. The external atmospheric and man made noise at these frequencies is relatively high. in suburban location. The dipole mode is more effective than the loop mode at these frequencies but with one very important remark. In these experiments the total setup ( amplifier, PC notebook and Perseus RX) is powered by batteries and there are no connections to the mains. The reason is that the dipole mode is very sensitive to common mode noise and any significant common mode current can make the system very noisy. If the system is powered from the mains ( amplifier by the normal transformer rectifier, Notebook with its own pulse PS and Perseus with its pulse PS) the result might be disastrous. It is very difficult at these frequencies to make effective common mode choke baluns since their inductance must be very high. Also symmetric dipole configurations must be used – asymmetric and ground plane setups are noisier. The loop mode is much more “quiet” instead of its higher noise floor and in conditions where mains PS are used it can be more effective. Remark: It is possible to use mains power supply for noise free LF reception in dipole mode. See the Application note “Reducing the Noise in Dipole Mode with Common Mode Filter” in Technical section of www.active-antenna.eu site. Fig.3 LF spectrum (10KHz – 220KHz) made with a vertical dipole (2 x 1m diam. loops as arms). The recording was made at 17:20 local time, 6 Aug 2011, suburban location near Sofia, Bulgaria. Perseus SD RX was used, preamp.= off, atten. =off. The whole setup (including the notebook and RX) was powered from batteries and there are no connections to the mains. The timing stations were identified as MSF-UK, BBU–Russia and DCF77- Germany. The digital transmissions are probably navy stations. d- digital transmission, t – time signal station, bc – broadcasting station. X-axis is in KHz, Y in dBm..
How do the IP parameters influence the reception? The IP (Intercept point) figures describe the immunity of the amplifier to strong signals. There are numerous descriptions in the Net or textbooks, so read them. The higher the figure the better the amplifier immunity to strong signals. Practically the effect of the non-linear distortions is exhibited in appearance of spurious signals on the band – e.g. spurious second harmonics of the very strong BC stations can be heard on receiver with low IP2. These signals do not exist on the band – they are generated by the receiver or antenna amplifier. This amplifier is a wideband design and both second and third order non-linear distortions are important. Usually in wideband designs the 2nd order spurious signals are stronger than those of third order origin. For a good wideband amplifier second harmonic output intercept point (OIP2) > 80 dBm and third harmonic OIP3 > 25 dBm will assure that in normal conditions (there is no nearby powerful transmitter) there will be no spurious signals. 1 dB compression point (CP1dB) is a measure of the maximal output undistorted signal amplitude. It is equal to the output power level at which the difference between ideal amplifier power output and measured amplifier power output becomes 1 dB. The CP1dB and third harmonic OIP3 are related – higher CP1dB automatically provides higher OIP3 in a well designed amplifier. What are the margins of the ambient temperature at which the amplifier is operational? The amplifier is designed to withstand external environmental temperatures in a broad range. In winter at temperatures above -20o C , the amplifier board (in a closed box) will have temperature above 0o C due to the power dissipation. The heaviest regime is the hot weather but the amplifier can withstand ambient temperature of up to 45o C without problems. Probably the amplifier will withstand even broader temperature ranges. Is the amplifier protected from external strong fields? The amplifier is protected from a field of a nearby transmitter with legal power ( 1-2 KW) if the distance between antennas is more than 20 m. For shorter distances a simple measurements must be performed as described in . Is the radio protected from external strong signals? This amplifier can give up to 19.5 dBm of undistorted power at 50 ohms load which is equal to 5.6 v pp amplitude (at equivalent input field intensity 125 dBuV/m or 1.8 V/m). Be aware that this voltage can occur only if there is a powerful transmitter in the vicinity of the antenna. For higher intensities the amplifier enters saturation state and the maximal output voltage is limited to 6 V pp. Generally this voltage can not damage the input of the analogue RX and TRX. But now on the market there are some direct sampling SDR where the input is a fast ADC (connected to the antenna usually through some kind of amplifier/driver). Usually these are 3 V devices and this 6V pp voltage can be dangerous for the chips. Unfortunately the producers of these radios do not specify the maximal allowable input voltages. For this reason there is an additional limiter in the Control board – see Mounting Instructions. The limited voltage is 4.2 V pp – this is a compromise between safety and reduction of the amplifier dynamic range. This voltage is 0.6 V higher than 3.6V supply of the 3V chips and usually is assumed safe. Check carefully the documentation of the radio for maximal accepted input voltages (if there is such item). Fig.4 RX protection for some DDC SDR controlled by the transceiver. The relay is driven by the – “Send” signal usually available in the most of the commercial transceivers. Usually 0V is the active level for the transmit state and in modern transceivers this signal precedes the RF output from the PA with several milliseconds. 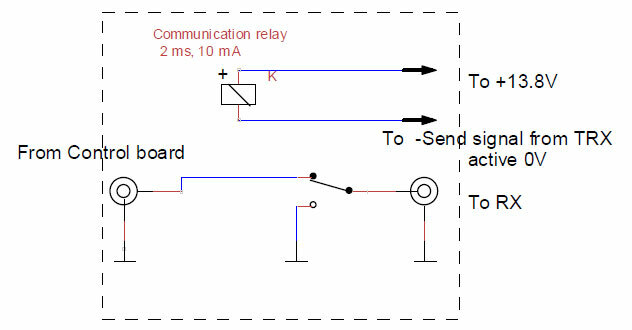 Use fast (1 – 2 ms) communication relay for this purpose. This circuit protects the receiver not the antenna amplifier which usually does not need any additional protections. This protection is not needed for the normal analogue radios. For the cases where this protection is not sufficient as in the case of a radio station, a simple relay protection should be build as shown on Fig.4. Can the amplifier withstand a nearby lightning discharge? The amplifier input is protected with fast clamping diodes. The protection is based on the analysis made in . We can not test them with lightning discharge, since we do not have an access to the lightning equipment : ). We have data for several amplifiers which are working flawlessly more than a year in yards of suburban houses. They work continuously and are not switched off during thunderstorms. Be aware that a very near stroke (5-20m distance) might induce high currents in uncontrollable paths – connecting cables, mains cable etc. and it is difficult to protect the device. The good thing is that such a near stroke is a rare phenomenon – most of the people will never have such an accident in their lives. The precautions for antenna safety should be taken if the antenna is placed on the roof or some other high place. (see ARRL Handbook and Antenna book, antenna safety sections). For certain environment conditions the loop can be grounded (see Q.24, Q26). Can the amplifier be used for phased arrays? Several amplifiers can be used to design a small antenna phased array. Each element of the array will have separate amplifier. The gain and the phase response of the amplifiers are stable within 2-3 % . A good quality FTP cable from single manufacturer, the same type, must be used for each amplifier to be sure that the cable delay parameters are stable. Use the same color pair in each cable for the signal path. What is the immunity of the amplifier to local EM noise? The amplifier is a balanced design (both for loop and dipole mode ) which largely reduces the common mode interference. The antennas (loop and dipole) are also symmetrical so the balance is quite good. The power supply of the amplifier (both + and – terminals) is also separated from the shield ground by chokes. There is also a transformer coupling between amplifier and cable with low parasitic capacitance. The amplifier is “floating” versus ground thus minimizing possible common mode currents. It must be mentioned that the dipole mode is noisier – it is sensitive to capacitive asymmetry of the dipole arms; also in urban environment the near field electric field strength component is usually higher. How can difficult “noise” cases be solved? The difficult cases usually are due to the noise generated from switching PS and most often from equipment which the user has around. The most usual case is when a PC with switching PS is included in the RX setup. Fig.5 There are two places where common mode baluns can be inserted – at the coaxial cable output and in the PS lines. Do not use baluns if there are no noise problems! In the Q&A for LF reception it is mentioned that a clear reception with vertical dipole can be accomplished if all connections to the mains are disconnected. This is not practical always and common mode baluns (choke baluns) have to be used. To be effective the common mode balun should have sufficient inductance which is difficult to fulfill at LF. But for the higher frequencies baluns can be inserted at specific places as shown on Fig. 5. The effect of these setups cannot be predicted since for every case the noise conditions are different. The user should have to test the effect of the baluns. Try the baluns one by one to understand from where the noise is coming. The choke baluns efficiency is proportional to their inductance but they have natural resonance frequency above which their impedance begins to decrease. Baluns with high inductance have lower resonance frequency and might be not effective at HF. Fig.6 and Fig.7 show some possible solutions which were tested at the laboratory and for the specific environment prove to be effective. There are excellent publications on these topics. 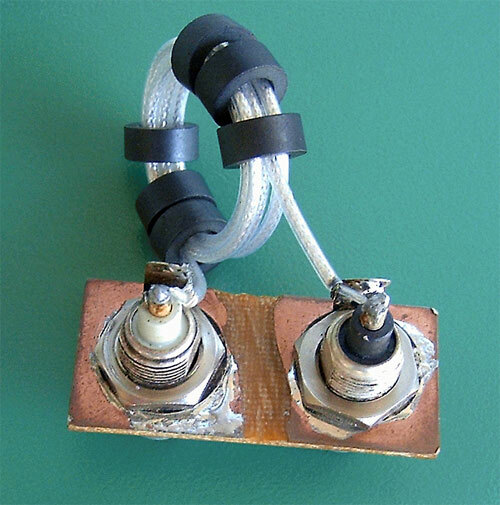 Fig.6 LF Common mode balun T1 with inductance of 2 x 22 mH. It can be used in PS lines. 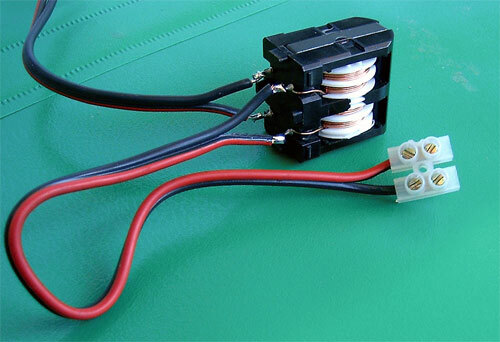 These transformers are cheap and widely available with inductance from 20 to 50 mH. This balun is usually effective at LF spectrum. For most cases PS balun is not needed but the author has a case where this type of balun was quite effective. Fig.7 Common mode balun T2 in the signal path. It is made with 6 turns of thin coaxial cable and 6 ferrite rings with permeability from 1000 to 4000. The inductance is between 100 uH to 400 uH. The efficiency of this balun depends from the properties of the magnetic material. Ferrite mixes 73 or 77 are suitable for broadband operation. Usually the noise problems are below 10 MHz. Be aware that there are cases where the balun might not work at all or the things might be worsened. It depends very much where the noise current path is. Do not use baluns if there are no noise problems! Remark: See also the Application note “Reducing the Noise in Dipole Mode with Common Mode Filter” in Technical section of www.active-antenna.eu where a very effective common mode filter is described. If the user has an access to good grounding point I strongly suggest using this filter. It will strongly reduce noise in dipole mode and also in loop mode. Do not use other baluns when using this filter. Can I use a metal box for the amplifier? The metal box will not give much advantages compared to the plastic box. The common mode currents might arise if the common point of the amplifier is connected to the metal shield. The metal box has an advantage for lightning protection. The box, cable shield, the amplifier GND terminal and the center point of the loop must be connected in one point and then to a stable electrical ground point. Do not use PS which is connected to the neutral mains conductor to avoid parasitic ground loop currents. This solution is important when mounting the loop in places where the possibility of near lightning stroke is high. This setup will substantially reduce the high common mode voltages induced by the stroke. In this case the dipole mode is lost. The loop antenna is unique in this respect since its center point can be grounded without any adverse effects in reception (Fig.4.2). If two switched loops with 900 plane angle are used, both loop central points can be connected to ground. Yes. The output impedance is approximately 50 ohms but if the amplifier is loaded directly with two 50 ohms RX inputs the load will be 25 ohms. There will be no adverse effects just the dynamic range, will be lowered. The gain reduction will be 3 dB. It is better to use some kind of a splitter to divide the output signal to the receivers in order to reduce the influence between them and to preserve the 50 ohms load to the amplifier. 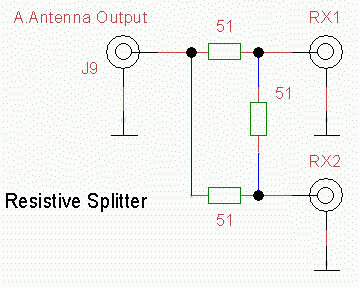 The simplest way is to use a resistive splitter (Fig.8) which has 6 dB attenuation for each port but in most cases the signal gain is sufficient. Wideband transformer splitters which have lower attenuation (3dB) and better isolation between output ports can be used also. Fig.8 Resistive splitter to connect two RX to the amplifier output. Should thick loops be used? To increase the sensitivity of the wideband loop its inductance should be minimized. This is accomplished by increasing the thickness of the conductor. An aluminum tube might be used for this purpose, but it is easier to use parallel conductors. See the Antenna section and also. The most effective way to reduce significantly the inductance is to use crossed parallel loops. Why use crossed parallel loops? More detailed description of crossed parallel (CP) loops is given in. The most important properties of CP loops are the ability to build loops with a large area and low inductance which still preserves the small loop radiation pattern. Their short circuit current is higher compared to a single turn loop with the same area and the sensitivity can be increased substantially. As can be seen from the MDS chart (Description and Specifications section) the CP loops are efficient at higher frequencies (above 1 MHz) where the reduction of the loop inductance is important. Below these frequencies the input impedance of the amplifier ( approx. 3 ohms) is of the same order or bigger than the loop inductive impedance and benefits are due only to the area of the loop not to the reduced inductance. Can I connect a large antenna to the amplifier? Yes, but if the signals from the antenna are too strong, intermodulation distortions might occur and spurious signals will arise. With large antenna the wideband flatness of the antenna factor will no longer be preserved. This amplifier is not intended to work as a general antenna preamplifier. Why use both a magnetic and an electric antenna? They have different directional sensitivity to far signals. They have different sensitivity ( both amplitude and directional ) for near signals. The EM field has two components – electric and magnetic part. We can build sensors (antennas) which are sensitive either to the magnetic component (small magnetic loop) or to the electrical component (small dipole). The term small means that these antennas have small size compared to the used wavelength. ( <0.1 wavelength). If the antenna is bigger it can no longer be made sensitive to only one component of the field. In the space far from the transmitting antenna there is a fixed relation between electric and magnetic field components – the so called free space impedance = 377 ohms. At such a point the two antennas are functionally equivalent and neither has any advantage. Only their directional patterns are different. The vertical loop has a complicated radiation pattern (figure 8 for vertically polarized signals and for other polarization almost unidirectional). The vertical dipole has a circular pattern with good low-angle gain. In the natural environment, especially in urban areas, there are numerous parasitic electromagnetic sources. They produce EM field– the so called reactive (or near ) field. The important thing is that there is no longer any fixed correlation between electric or magnetic components. In some cases the electric component might be much higher than the magnetic one and vice versa. In such cases these two types of antennas have different sensitivity and using one of them might reduce the noise substantially. Usually in urban environment the loop is quieter antenna for the local man-made noise and gives better S/N ratio compared to the vertical mode. In rural areas where the local noise is low the vertical dipole mode is more sensitive to sky wave signals due to its lower noise floor. By switching between the two modes the user can choose the best antenna for the moment. Is the loop a directional antenna? The vertically oriented small loop antenna has figure 8 pattern (sharp null) only for vertically polarized waves and that is for all frequencies for which the loop length is less than 0.1 of the wavelength (this is for the single loop, for the crossed parallel loops see). For other wave polarizations the null is not sharp or there will be no null at all. Most of the waves reflected from the ionosphere have random polarization which is not stable and changes sometimes very quickly. That is the reason for the loop to have unstable directivity on higher frequencies. The small loop will be directive for a local man-made noise field which polarization is vertical. Usually (but not always) this is so. You should expect very good loop directivity for local noise. For LW and MW stations during daytime the directivity will be very good and not so good for the night time. On SW sometimes you will have directivity but it will be unstable. The benefit of using an antenna rotator to improve the SW reception is questionable. Why the vertical dipole mode has very low gain at my location? The vertical electrical antenna is influenced very much by the nearby objects especially if they are conductive. The dipole antenna placed for example at the balcony of a large concrete building will suffer very much from this effect and the sensitivity might be reduced dramatically. Placing the same antenna at a clear place will recover the sensitivity. The loop antenna is free from this effect and is much more effective in these environmental conditions. In concrete building, in the loop mode, there still can be received some strong stations, in same circumstances the dipole mode is completely useless. Are there any requirements for antenna placement? Put the antenna where your local conditions permit but as far away from buildings and electrical lines as possible. But be aware that the man-made local noise usually has near field origin. The attenuation of the near field intensities usually follow square or cubic law from the distance of the source and every meter away from the noise source is important. Usual noise sources are LAN cables, cable TV, all types of switched power supplies and their cables etc. Rotate the antenna until the local noise at frequencies of interest is reduced. Some manufacturers recommend placing the loop antenna at least 5 to 10 m away from the building. Such a distance (if it is possible) will ensure relatively lower noise and good reception. The same holds true for the small dipole antenna even at greater level. The loop mode can be used even in a room but with reduced sensitivity which depends very much on the type of building. What must be the height of the antennas? As for any antenna the height is an important factor for receiving low angle ionospheric reflections from DX stations. If the conditions permit the loop can be placed on good height which will increase the level of the low angle signals. But the effect will not be dramatic since these are vertically polarized antennas and they can work at a very low level from the ground, especially if the ground conductivity is good. The loop antenna was tested at 10 cm (lower point) to the ground and its performance was quite satisfactory. The vertical dipole is more sensitive and I suggest at least 1.5 m minimal height of the lowest point above the ground for good results. If a horizontal dipole or loop are used the case is quite different and the height becomes very important. Why to use a vertical dipole instead of a ground plane? The voltage amplifier part has the ability to use separate electrical antenna (set by jumpers). A classic small ground plane antenna might be connected there – one of the V terminals to 1.5 – 2.5 m long whip and the other V to ground. Usually this setting will increase the signal level with several dB (depending on the ground parameters). But this setting has two drawbacks: the increased common mode noise and reduced effective dynamic range due to larger signal levels. If the user lives in an electrically quiet place this solution might be very successful. It is possible to ground the center of the lower loop as shown in the Fig.9 and this will transform the vertical dipole into a ground plane. Fig.9 Grounding the center of the loop does not change the loop performance. In dipole mode this setup is equivalent to a ground plane antenna. This type of grounding does not change the loop mode parameters! One precaution – connect the loop to ground via a capacitor (any value between 500 and 100000 pf) to avoid parasitic currents (50 or 60 Hz) due to potential differences between the neutral mains conductor and ground (which sometimes might be substantial). This is valid only for cases where the power supply of the amplifier is connected to the neutral mains conductor. For urban locations we strongly recommend the use of a symmetric vertical dipole which behaves much better with local noise. Can I use a horizontal dipole or a horizontal loop setup? In the dipole mode, if loops are used as arms of a dipole, they can be set in a matter where the electrical dipole is with horizontal polarization (see Antenna section). But this type of dipole needs height. The user now has two antennas with different polarizations (the loops are still in vertical plane). Loops placed in the horizontal plane have horizontal polarization and circular diagram. At low heights, the horizontal loop has very low sensitivity to sky waves so this setup must also be placed at a good height ( > ¼ wavelength) in order to have sufficient sensitivity. It might happen that the horizontally polarized antennas are very quiet for the local noise since its EM field is usually vertically polarized. Is the antenna gain in loop and dipole mode equal? The antenna gain of both amplifiers is set to be approximately the same when using two loops with 0.6 – 1m diameter also as a vertical dipole. For other sizes antennas the gain difference will be increased. Where should be connected the ground terminal? The GND terminal is only for protective ground against lightning discharges. Internally it is connected through a zener diode limiter to an amplifier common point. In normal conditions the limiter is closed and the amplifier common point is left floating. Only when there is a strong EM field the zener diodes open thus limiting the common mode voltage. Connect this terminal only to good ground point (a rod inserted into the ground or some other point which has a firm ground potential). If there is no such a point (e.g. the user is living in an apartment) it is better to leave this terminal not connected. What kind of antenna should I build? If you are using mostly SW bands “Two loops in one plane and symmetrical vertical dipole” (see Antenna document) is a good choice. If LW and MW are the goal, then “Two loops in orthogonal planes and symmetrical vertical dipole” since the directivity can be used successfully. There is no point using big loops in an urban environment where the local noise is high. For an urban apartment inhibitor single 0.6m diam. loop with two parallel thin conductors or two simple CP loops with 0.5 m diam. made from single thin conductor might be sufficient. For quiet rural places larger loops and dipoles must be used to reduce the loop noise floor. 0.8 to 2 m2of total loop area and preferably CP mode are suggested. Can the antenna switching be performed digitally? The schematic of a simple circuit for digital control of the antenna modes is given on Fig.10. Fig.10 Digital control of antenna modes. D0,1,2 are 5 V digital control lines. The interface must be optically isolated with opto-couplers to avoid possible ground loops that increase noise. This interface has to be connected to the J2 connector of the Control board. PC printer interface outputs can be used to control D0 – D2 lines. Why the amplifier is not supplied with a ready made antenna? The total price is reduced (including the price of delivery). The user, depending of their recourses, might want to build a different loop antenna – larger or smaller. For those who want to have the best S/N ratio, bigger crossed – parallel (CP) loops are suggested. 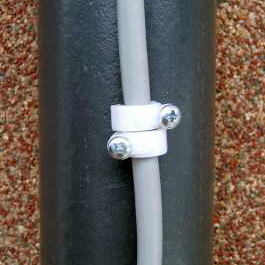 The loop construction is simple and with minimal efforts excellent antennas can be put into operation. PVC tubes (or wood) and PVC insulated electrical cable are cheap and widely available. The necessary tools are drill and solder. How close can be the active antenna to a broadcasting station without any adverse effects? A field experiment was performed: MW broadcasting station at 864 KHz (radio Blagoevgrad), power=50 KW with 1/4 wavelength vertical antenna. The active antenna (as described in the Antenna section 3.3) was placed at a distance of 2.5 Km form the transmitting antenna. The terrain was flat (field) without any obstacles between two antennas. The loops were pointed toward transmitter for maximum output signal. The SDR receiver was used for measurements (Perseus was with Preselector=ON and attenuator = 30 dB). The measured output signal level from the amplifier in 2-crossed loop mode was +8.2 dBm. No sign of any distortions were found in the whole frequency spectrum of the receiver. In vertical dipole mode the output level was > +19 dBm and the amplifier was driven into saturation. At 10 Km distance with the same setup no signs of any distortions were found in both modes. Why to use FTP cable? There is less common mode noise compared to the coaxial cable. There is no need to decouple the power supply and we have additional wires for control purposes (relays, rotator). The RJ45 connector is one of the most reliable connectors. It has been used in heavy industrial environments with great success for many years, and it is cheap. In any case RJ45, CAT5 FTP cable combination is a VHF design – these are not audio or telephone cables. Remember that these cables are used for 1000 Mb/sec LAN! How long can the cable be? The length is limited by the attenuation of the cable. If the receiver noise floor is low, a substantial length of cable can be used. For example, if the MDS of RX is -140 dBm, then 100 m of cable will reduce both the signal and noise levels with 6.5 dB at 10MHz. In this case the noise of the amplifier will still be 10 dB above the RX noise floor. For 50 MHz this length is still acceptable with very slight degradation of sensitivity. The DC voltage drop on the cable must be assumed also. See Mounting Instructions section. Why is the shield of the FTP cable not connected in the amplifier side? The antennas and the amplifier are all symmetrical balanced types. The balanced designs have natural immunity to common mode signals. The problem arises when the parasitic impedances to ground of the two sides of the balanced scheme are not equal (which is true very often). The common mode current flows through these impedances and the voltage drop across them is unequal; this leads to parasitic differential voltage at the amplifier input. So in any case, irrespective of the balanced scheme, the common mode current should be minimized. Connecting the cable shield to the amplifier common point might increase substantially the common mode current and this current can not be controlled since it depends on many random factors. So it is better to leave the shield open. Can I use unshielded CAT5 UTP cable? The unshielded twisted pair cable is well balanced and in certain conditions it can give satisfactory results. The common mode noise might be not so high. The recommendations are to use the UTP cable only for quick tests or in field conditions. How to fix the CAT5 cable to the mast or to other objects? The CAT5 cable twisted pairs are made from solid copper wire – not stranded. This cable should not be allowed to move freely in the space and must be fixed to the mast or other non movable objects. Here are some pictures of possible solutions. Fig.11 Using plastic clamps for 6mm cable. These clamps are prepared to be used with nails but 2.9 mm screws can be used instead. Widen the hole of the clamp with 2.9 mm drill. The wall thickness of the PVC tube is usually sufficient to hold the screws tightly. These clamps are very cheap and can be used to fix the cable to its path to the shack. 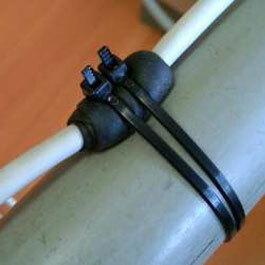 Fig.12 Put several layers of self-amalgamic tape around the cable and fix it with cable ties. Usually the cable shield is made from thin aluminum foil which might be cut if the cable is fasten directly tightly with ties without any protection. Also several layers of cloth tape can be used for this purpose. Even UV resistant ties must be replaced after 1-2 years if they are exposed to direct sun light. 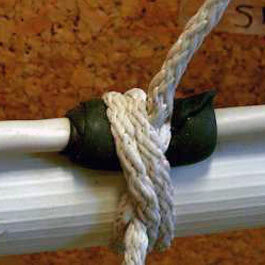 Fig.13 Old fashioned marine style fix with double constrictor knot. Use thin polyester rope which is UV resistant and will last for many years. Again aself-amalgamic tape is used as a protector. QuestionsWhat are the requirements for the DC power supply (PS) voltage?What receiver sensitivity do I need?What is the real sensitivity of the active antenna?Can I receive stations in LF band?How do the IP parameters influence the reception?What are the margins of the ambient temperature at which the amplifier is operational?Is the amplifier protected from external strong fields?Is the radio protected from external strong signals?Can the amplifier withstand a nearby lightning discharge?Can the amplifier be used for phased arrays?What is the immunity of the amplifier to local EM noise?How can difficult “noise” cases be solved?Can I use a metal box for the amplifier?Can two receivers be connected to the amplifier outputShould thick loops be used?Why use crossed parallel loops?Can I connect a large antenna to the amplifier?Why use both a magnetic and an electric antenna?Is the loop a directional antenna?Why the vertical dipole mode has very low gain at my location?Are there any requirements for antenna placement?What must be the height of the antennas?Why to use a vertical dipole instead of a ground plane?Can I use a horizontal dipole or a horizontal loop setup?Is the antenna gain in loop and dipole mode equal?Where should be connected the ground terminal?What kind of antenna should I build?Can the antenna switching be performed digitally?Why the amplifier is not supplied with a ready made antenna?How close can be the active antenna to a broadcasting station without any adverse effects?Why to use FTP cable?How long can the cable be?Why is the shield of the FTP cable not connected in the amplifier side?Can I use unshielded CAT5 UTP cable?How to fix the CAT5 cable to the mast or to other objects?